Reviewed! 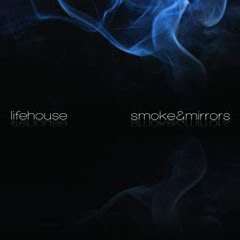 Lifehouse - "Smoke and Mirrors"
It took Lifehouse three years to pen their fifth full length “Smoke and Mirrors,” longer than it has taken the Malibu, California products to put together any other album in their 10+ year existence, a new record that finds the band abandoning some of their patented done to death pop rock tendencies that have made them so much money in the past for something a little more contemporary, an almost classic rock feel if you will. It doesn’t take long into “Smoke and Mirrors” to get a good look at Lifehouse’s agenda this time out – they are out prove themselves as a credible rock band, not just a band known for writing sappy pop ballads. Opener ‘All In’ establishes a certain tone early on, while songs like lead single ‘Halfway Gone’ and ‘Smoke and Mirrors’ help to lead the band’s guitar/vocal driven aesthetic into battle. The albums title track especially offers up a classic rock vibe ala Tom Petty (think Foo Fighters on ‘Wheels’), which is really what the band is going for this time around. While “Smoke and Mirrors” offers up some fine outtings like ‘Wrecking Ball,’ it also offers some songs that completely miss the boat, and seem not to fit, like the jerky ‘Nerve Damage’ and the electro-soaked ‘Here Tomorrow Gone Today.’ Oh yeah, and as you would expect, or should expect, the ballads are here as well. Songs like ‘It Is What It Is’ and album closer ‘In Your Skin’ find Lifehouse doing just what they do best, slow the pace, halt the tempo and pluck the heartstrings through frontman Wade’s endearing, empassioned vocals. There a good chance you may have already heard the single ‘From Where You Are,’ as it was written as part of the Allstate Teen Driving Program. It’s dedicated to those teens who have tragically lost their lives in accidents, and attempts to serve as an educational tool, or wake up call, for teens to drive more safely in the future. ‘From Where You Are’ is also dedicated to a friend of frontman Jason Wade that was killed in a car accident at the the age of 16. Even though with “Smoke and Mirrors” Lifehouse seemed destined to accomplish a goal, the band often fall back into the rut of sounding exactly the same as they ever have. Now, that’s not necessarily a bad thing, its just more of the same.